That is the question … The Sports category of the 2015 World Press Photo Competition was mired in controversy when it announced that awards were only to be made for first and second instead of the usual three. All other images that made it through to last round were subsequently disqualified for ‘excessive manipulation’. In fact twenty per cent of images across all categories that made it through to the penultimate round were thrown out for the same reason. So what exactly is excessive manipulation and what’s being done about it? Back in June 2014 The World Press Photo organisation commissioned a research project on ‘The Integrity of the Image’ and currently, The Photography Society of America Board of Directors are striving to approve a new definition for Photojournalism for use in PSA competitions. What follows is the current proposal. Photojournalism entries shall consist of images with informative content and emotional impact, reflecting the human presence in our world. The journalistic (story-telling) value of the image shall receive priority over pictorial quality. In the interest of credibility, images that misrepresent the truth, such as those from events or activities specifically arranged for photography or of subjects directed or hired for photography, are not eligible. Techniques that add, relocate, replace or remove any element of the original image, except by cropping, are not permitted. The only allowable modifications are removal of dust, scratches or digital noise, restoration of the appearance of the original scene, sharpening that is not obvious, and conversion to greyscale monochrome. Derivations, including infrared, are not eligible. This statement is very much in line with the World Press Photo paper and is looking to be ratified by FIAP (Fédération Internationale de l'Art Photographique). FIAP is an international umbrella organization of national associations of photography so any decisions made by them will trickle down to all of us and cement the rules for documentary and photojournalistic endeavours. I believe that these proposed rules are trying to steer people into telling the truth with their photography and whilst that is a noble goal, truth is often more subjective than universal. Two men approach the Rabbi in order for him to help solve a neighbourly dispute. The first man sets out his case to the Rabbi who listens intently. The Rabbi tells the man he is right and they should hear what his neighbour has to say for himself, but after the neighbour argues his side, the Rabbi turns to him at the end and says that he is also right. At this point the Rabbi’s wife interjects and says “but they can’t both be right” and the Rabbi replies to his wife “and you’re right too”! If everybody is right, then it follows we all see the truth in a different way. In even more skilled hands it can provide a narrative but never a universal truth. Once we accept that a camera can lie and that, in the vast majority of cases, photographs usually only tell part of the story or tell it in a distorted form, then we can accept that defending the ‘credibility’ of a photograph is futile. It is surely more productive to accept the credibility, or not, of the actual photographer. Now don’t get me wrong, not everyone’s a saint, there are some absolute howlers out there. The World Press Photo research paper cites cases that are clearly unacceptable including, amongst others, the case of a Swiss tabloid back in 1997 that transformed a pool of water at the site of the Luxor Massacre into a stream of blood. Interestingly, it cites this as “excessive toning” as opposed to downright misleading. I would say that it was distorting the truth in the same way as the Israeli newspaper The Announcer (HaMevaser) that recently published a photo of the World Leaders at the Charlie Hebdo march in Paris without any women in it! 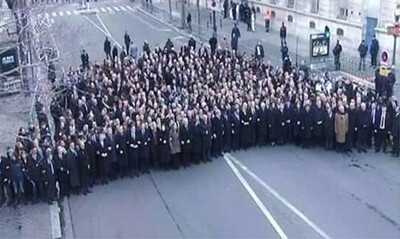 The German Chancellor, the Mayor of Paris and the Danish PM were all missing! The newspaper concerned was very orthodox and the doctoring of the image was born out of extremist views. I don’t excuse it, not one little bit but I hold the unfashionable view of understanding someone else’s point of view without agreeing with it. In other words, I can allow myself to see the rationale. The worlds press was duly outraged and we, the public, were duly informed; but the original photo was no better, it was a collective lie and completely inexcusable. It implied that the leaders were at the head of a march that pushed its way through the streets of the French capitol; our leaders, unafeared and in solidarity with the people. The truth was that image was staged and the leaders were separate and protected, they were safe in their own little cordoned off side show. The media photographed it and placed it on front pages the world over yet they all knew the images were misleading. It is all about the ‘intent’ to deceive, the image of the ‘great and the good’ is designed to appear that they are at the head of a 3.7 million strong demonstration in Paris. The truth is very different! This bending of the truth by using the ‘frame’ is deplorable when employed ‘en masse’. This leads us into not trusting the photographer, just the image, and we are fooled into thinking that image is only credible if it is undeveloped. This view is reinforced by the World Press Photo organisation, the Photographic Association of America and others; but how did they form this view? World Press Photo made contact with ‘Industry Leaders’ (a subjective term in itself, especially when you consider the changing ways in which information is disseminated) asking them to express their views but actually they only asked ninety five people, more than half of whom didn’t bother to respond. The remaining forty five took part in the questionnaire; but can this small number of people really be representative? The ‘powers that be’ were certainly out of sync with the large number of entrants that were disqualified for “excessive manipulation”. It’s a loaded phrase; the word ‘manipulation’ has very negative connotations especially when what we are actually talking about is developing a photograph. There is a view that is becoming more prevalent that says there should be no development of the RAW file whatsoever. That the image should be produced entirely ‘in camera’. This runs contrary to over a hundred years of good photographic practise. There has always been a whole armoury of measures used to improve the quality of images. A good printer could work on the negative itself to recover lost highlights in a sky, a good printer could even replace the sky, a printer could use intensification to increase contrast and then there’s all the dodging and burning and a whole host of other techniques. At the end of the day, what was produced was a print. That print was judged on its own merit and nobody ever had the temerity to demand to see the negative in order to establish the credibility of the scene. The credibility lay with the photographer. The job of the printer, whether the actual photographer or not, was to make the scene itself as palatable as possible. Ansell Adams compared the negative to the musical score but the print to the symphony as it can be interpreted in so many different ways. There have been books written on how he developed a single photograph; are we simply to ignore that wealth of knowledge? Are we happy to just read the musical score but never hear the symphony? 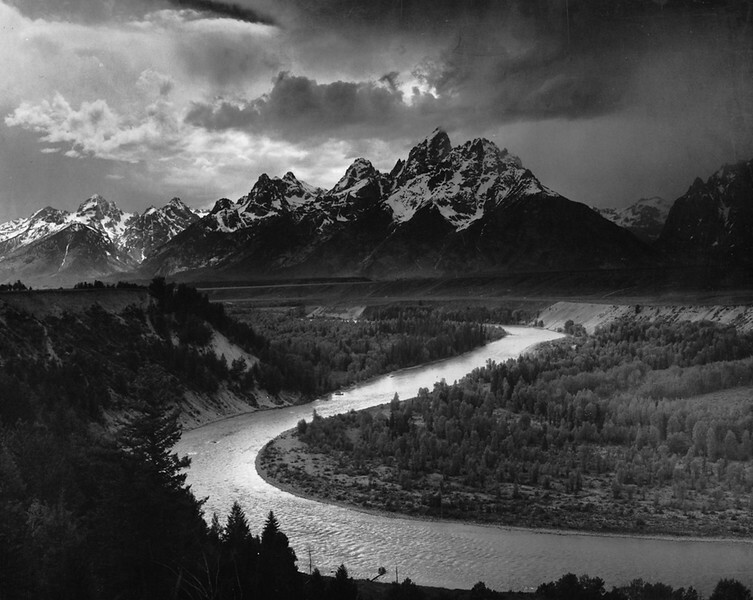 This image of Tetons and the Snake River is a case in point. Printed correctly, there is detail everywhere from the darkest blacks to the brightest whites. It’s printed using a technique developed by Adams called the Zone System. By using local adjustments to the luminescence of the scene it allows the photographer to develop rich and subtle prints with a finesse previously reserved for the artist. 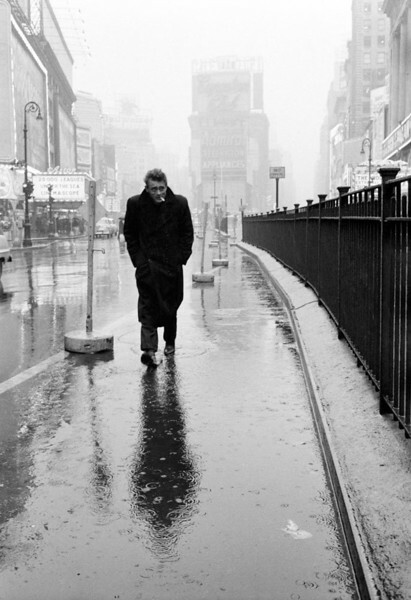 Dennis Stock took what is now regarded as an iconic image of James Dean on Time Square. To the untrained eye, it might easily be assumed that this image was shot then developed into a print without much being done to it; that the scene was in essence ‘in camera’. Have another look and see it again with all the printing notations written on it. The first thing I notice is the detail in the railings that were previously rendered as a black blob. Remember this is film, those details haven’t been added, they were already there. They have simply been teased from the negative in much the same way as, these days; details can be recovered from the RAW file. If we look at the finished article, surveying the scene, you can almost feel the cold and the wet driving against that upturned collar. Are we really proposing that there is no credibility in this image because both Dennis Stock and Pablo Inirio, the printer, dragged every last ounce of atmosphere out of the scene? Are we really happy that the PSA are proposing that the story-telling value of an image should receive priority over pictorial quality? The word used to describe this genre of photography is “photojournalism” and “photo” gets top billing! The image should always be the best it can be. What is more, the truth of this scene has not been altered one jot. The important thing is that there has been no attempt to deceive. Would this image now fall into the category of ‘excessive manipulation’? I don’t think it should. Included in the allowable manipulation, or developing as I would prefer to have it called, is a conversion to greyscale. Is that simply pushing a button on a computer or is it indulging in the art of monochrome photography? I don’t wish to allow the soulless algorithms of the computer to decide on my finished product. Black and White photography is not about looking at the world through a grey prism. It is about the subtle art of directing the viewer to the parts of the image you want them to look at as prescribed in the Zone System. 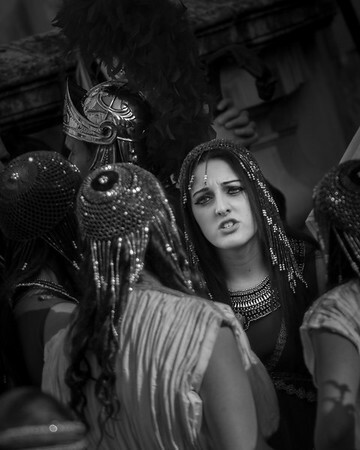 The adjacent shot was taken at a religious festival in Malta. In order to get the face of the “High Priestess” exposed in the way I wanted, I came close to completely blowing out the foreground detail of the image. Your eye was automatically drawn to the dresses which were, by far, the brightest part of the picture. I have subsequently darkened the foreground to draw the viewer to the part of the image I found most important. I don’t believe that process has altered any “truths”. The tools used to lighten and darken parts of the image are just as important as the use of depth of field to draw the eye. This is not about the “restoration of the appearance of the original scene” but about how, as a photographer, I want to interpret the scene in front of me. That ‘interpretation’ is the art of the photographer. Without it we simply re-render the scene presented to us without any thought. It’s interesting that a large proportion of the people that consider post production in itself as cheating; use cameras with all ‘the bells and whistles’ on. These days, we have cameras with razor sharp 61 point focusing in three modes plus live view. Evaluative metering across 63 zones, Partial metering, Spot metering, and Centre weighted average metering. We have clever things like exposure compensation and bracketing, flash compensation and bracketing, automatic white balance and bracketing, ridiculously high ISO’s, exposure lock, drive modes and a whole host of other things like histograms ... and some people say “I’m a real photographer because my pictures are straight out of the camera”! The reality is that these pictures are already coming out of a computer. If your camera has an ‘on’ button, then it is making choices on your behalf; you can take those choices back, and make them your own, in post production. Even if you switch the camera to full manual it meters for the light and tells you if it thinks your exposure will be right or not, and all of that is before we get into the improvements made to lenses. Super zooms and image stabilisation are game changers. The art of taking a picture was much more difficult when you needed a 22% grey card, a white card, a light meter, and the knowledge needed to select the right aperture and shutter speed. I don’t bemoan its loss, I just wonder why the comparison is so rarely made and the one with post production is. Both World Press Photo and The Photographic Association of America hold one thing as sacrosanct, and that is the addition or subtraction of individual pixels … or so they would have you believe. The PSA are proposing that techniques that add, relocate, replace or remove any element of the original image, except by cropping, should not be permitted. Unless, that is, you’re talking about sensor spots. Sensors spots occur when the inside of your camera is dirty and appear as grey or black spots on the image. The only way to remove them is to clone pixels from another part of the image. So it’s Ok to ‘tidy up’ the image by relocating parts of the original to cover up sloppy management of your hardware, but not OK to tidy up the image for any other reason. I presume this is to protect the abstract notion of truth or credibility in an image, but is it really so important? 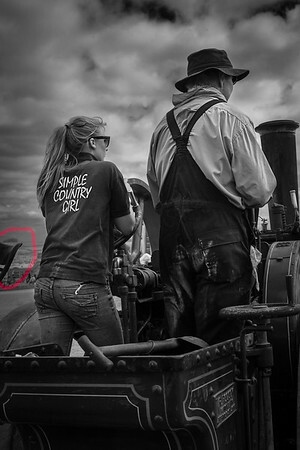 To the right is an image of mine taken at the Great Dorset Steam Fair ... The image is about the Preservation Movement. It is about handing over to the young and about the increasing number of young women that count themselves amongst that movement. There is also a sub-context here, it’s about the “Simple Country Girl”, and it’s about the comparison between spending some time enjoying driving a Steam Engine as opposed to spending time sitting at a Bus Stop playing with an App on your phone. Or, at least, that’s the way I see it … it’s a personal view point but it’s the truth as I see it. There is, however, something that really niggles me in this picture and that’s the piece of iron work protruding into the frame, middle left. I find it a distraction. I was fully aware of it when I was shooting but it was impossible to frame the picture in such a way as to exclude it. Would it really damage the truth or credibility of the picture if I were to remove it? The image isn’t about the layout of the engine. Its removal wouldn’t affect the central premise of the image. In other words, it wouldn’t affect the story, so therefore wouldn’t affect the truth of the image. Its removal would serve to make the image stronger; in fact, its removal should allow the viewer to concentrate more on the narrative by being less distracted. However, the removal of the person on the right would clearly be wrong. It would not only be altering the truth of the story but would also be changing a significant amount of the pixels caught within the frame itself. Likewise, adding something physical to the image that wasn’t originally there (coal dust on the face for example) would be altering the truth in an unacceptable way. Perhaps the caveat should be nothing physically added and only “artistic blemishes” to be removed, but those blemishes should happily extend beyond sensor dust. Now that the metalwork has been removed, I am much happier with the image, shown left, but not happy that it may fall foul of the definition of being photojournalism or documentary photography. If the spirit with which it was taken matters at all then this is certainly a documentary photograph worthy of a place in any photo essay. World Press Photo do allude to that spirit by stating that “manipulation is a specific form of processing, where the material change to the image through the addition or subtraction of elements are designed to deceive or mislead the reader/viewer”. There is certainly no wish to mislead here but I still feel that this image would fall foul of its judging process. In fact, World Press Photo goes on to contradict themselves by stating that the Industry Standard is “the alteration of an image, where alteration means the digital addition or subtraction of elements, is forbidden”; regardless of the photographers intent. I’d like to talk about the development of a photograph in general. Like most of us I don’t use a film camera; I use a digital one and the two beasts are not the same. With a film camera you should strive to get the exposure as near perfect, in camera, as possible. That is simply not the case with digital. In a digital camera the information taken during the exposure is recorded onto a sensor, the sensor records fifty per cent of its information at the top twenty per cent of its recordable light spectrum. Therefore, to record as much detail as possible, you should over-expose the image as much as you can without blowing out the highlights. It’s a practice known as exposing to the right. At first glance the image will look washed out but the exposure can be recovered with adjustments to the contrast and brightness sliders during RAW conversion. The resultant image will have far more detail than one that was exposed ‘correctly’ in camera. Is this good camera practice to be permitted or is that too much tinkering? You can’t improve photography by stripping away all its skills. You can’t divorce photography from the art of printing, or what we now call processing. If the photographer is to be banned from bringing anything to the party then photojournalists may as well shoot everything on their phones and let the chips fall where they may. Years ago the Kodak Eastman Company had a slogan; “you push the button and we’ll do the rest”. This advertising slogan has entered the public consciousness. Consequently, a lot of people believed that all you had to do to take a good photograph was to “just push the button”, and it seems that the PSA may believe the same. Well I don’t. I don’t believe it anymore than I believe that Coke is the “real thing” or that I will be “loving it” if I go to McDonalds, and thankfully there is a long line of esteemed photographers before me that don’t believe it either. Do we need definitions? I’m not convinced but feel sure that it will all be eventually neatly pigeon holed. I’m not sure it will help anyone’s creative processes. I think that in Documentary Photography or Photojournalism we just need to recognize when a photographer is striving to show their own truths and dam the process. Photography is about the final image, it always has been. The notion of “pure” photography surely died with the Daguerreotype. Ever since Fox Talbot introduced the negative/positive process; photographs needed to be developed. World Press Photo states that “photos cannot be staged, posed or re-enacted”. This position is co-opted by the Photographic Society of America who warn against subjects directed or hired for photography. Try as they might to convince us; we all know that this is not an industry standard. 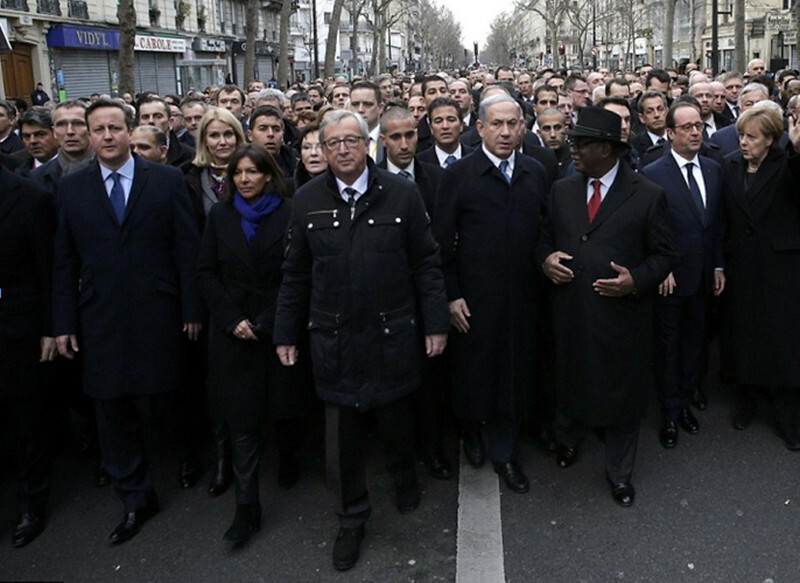 The photograph of the World Leaders at the Charlie Hebdo March being a case in point. For that matter; when was the last time anyone saw a photograph of the Royal Family that wasn’t staged? Politicians, Royalty, Celebrities and others constantly manipulate the way their images are taken, and the press constantly serves it up as truth. So, let’s put aside the fact that these organizations are trying to preach industry standards that clearly don’t exist and look at the issue itself. Are staged photos such a terrible thing? Again, I believe it depends on the photographers’ intent. Most people will have seen ‘The Kiss’ by ‘Robert Doisneau’. 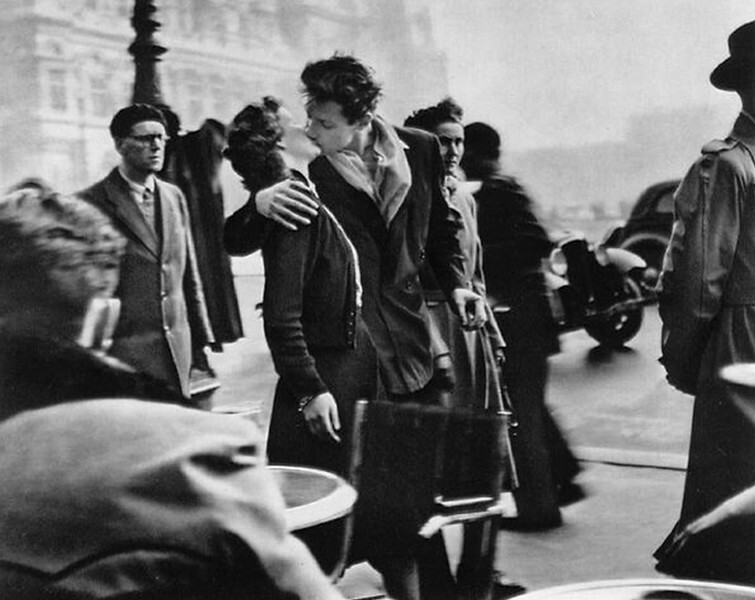 Doisneau observed the young couple kissing and asked them if they would do it again for a photograph. He then photographed them in three different locations including the scene outside the Hotel de Ville which became the image known the world over. The question is; is the image valid? The answer, for me, is yes. It speaks of Paris, it speaks of the era, it speaks of young lovers and the human condition. The kiss is real and the connection felt by people the world over to this image is also real. So where is the deception? The intention of the photographer was to show two young people snatching a kiss amongst the hustle and bustle of the crowded streets surrounding the Parisen café culture. He directed his subjects and captured the moment beautifully. In this instance, the staging of the scene helped the photographer to convey the truth of the ‘Eternal City’. Robert Doisneau was a master at setting a scene. One of my favourite photographs is ‘Le Regard Oblique’, also by Doisneau. The photographer set the paintings up in the antique shop window, set his camera to capture the image then sat back, like a spider, to see what he could catch in his web. Again, he caught a fantastic moment that says so much about the people caught in that slice of time. This is surely a documentary photograph, it says so much more than the images we regularly view as street photography. It was because of the staging that the photographer was able to capture a truthful moment; and it is still that truth that is the most important thing. 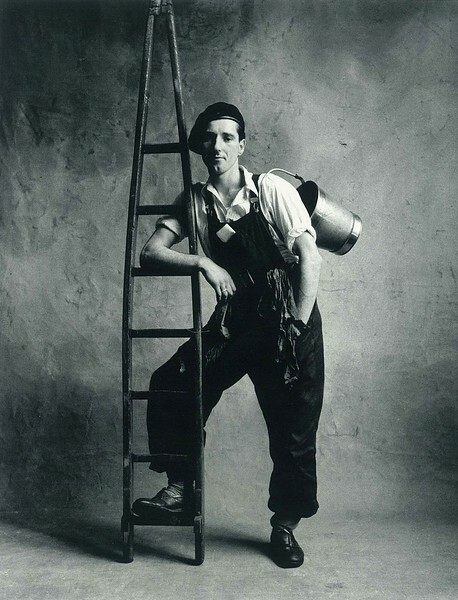 Irvin Penn shot a series of images over several decades called Small Trades. 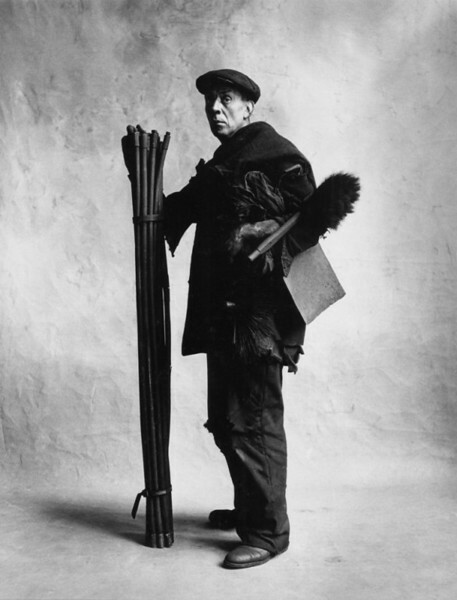 It was shot in London, Paris and New York and consisted of recording trades people, dressed accordingly and sometimes with the tools of their trade in a studio environment. The fact that the subjects are obviously directed doesn’t make this body of work any less of a “document”. In fact, that very treatment lends a dignity to some of the subjects that would not normally be afforded to them by the general populace. It could be argued that that changes the truth because it affects the way the viewer is interacting with the subject but actually, for me, and probably for Irvin Penn it allows the inner truth of the subject to be revealed. There’s many a road sweeper or dustman that’s a proud man. Perhaps if there is to be a difference between the genres of Documentary Photography and Photojournalism, then this is it; whether the subject has been directed or not ... but there still has to be that striving for truth. 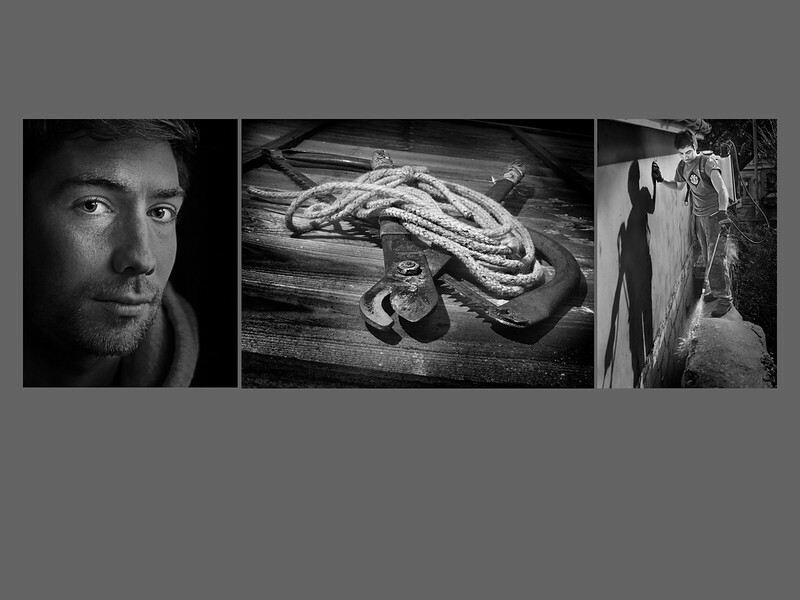 I used a similar approach when producing a series of triptychs for a project documenting the self employed. 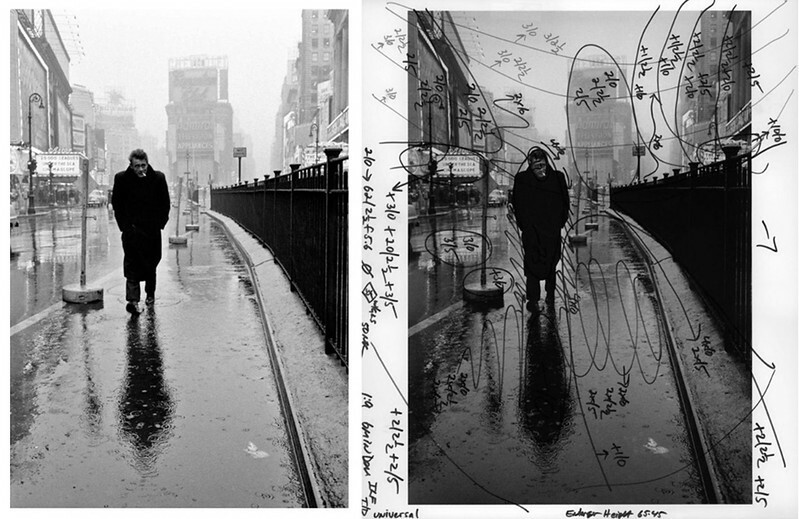 Both the portrait and the tools were shot in a contrived fashion whilst the third image was taken “in the field”. My hope is that by including the portrait, you see the person before you see the menial tasks that person has to perform in order to help in the shared task of providing for their family. I can see the argument that by directing the subject it could be deemed that this is not Photojournalism but cannot accept that this is not Documentary photography. Nor can I except that by using the Zone System to enhance any atmosphere that I have committed the sin of excessive manipulation.